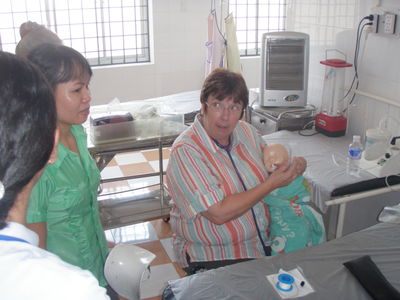 Every year the NZ VN Health Trust fundraises to cover the $5,000 per head it costs to pay for volunteer medical or nursing specialists to take annual leave and spend two weeks teaching full-time in Vietnam. A $20 donation will cover the cost of one commune health centre midwife attending a one-day training workshop in providing newborn care designed to reduce child mortality and morbidity in more remote Binh Dinh. A $40 donation will pay for one district doctor to attend a two-day training workshop designed to improve hospital care standards. 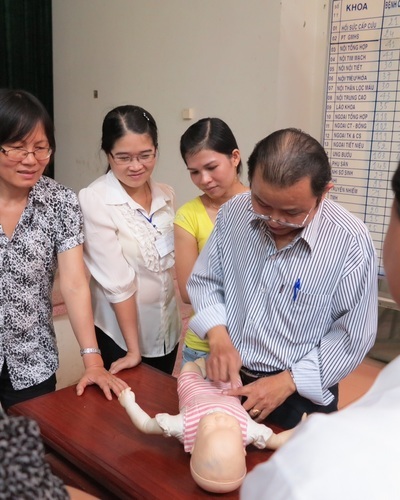 A $100 donation will pay for five neonatal nurses or midwives to attend a one-day training intensive in neonatal resuscitation, kangaroo mother care, breastfeeding and infant nutrition. A $250 donation will enable a paediatrician to run a specialist teaching ward round attended by doctors and nurses in an intensive care unit. A $500 donation will enable a specialist paediatrician to spend half a day advising local Department of Health officials planning new hospital facilities (for example, ensuring hospital design enable neonatal paediatric services to easily attend the resuscitation of a baby at delivery), and spend half a day teaching.